Description: New York Times bestselling author William Kent Krueger joined the ranks of today's best suspense novelists with this thrilling, universally acclaimed debut. 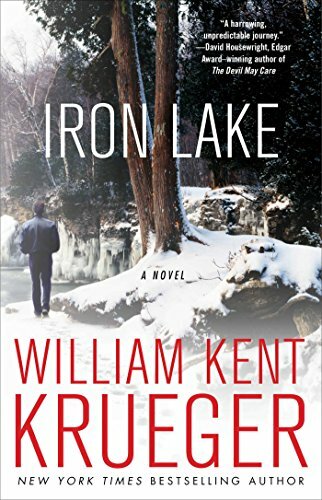 Conjuring "a sense of place he's plainly honed firsthand in below-zero prairie" (Kirkus Reviews), Krueger brilliantly evokes northern Minnesota's lake country—and reveals the dark side of its snow-covered landscape. My Thoughts: The first Cork O'Connor mystery introduces him to audiences and tells an entertaining story about secrets hidden in a small Minnesota town. Cork is part Anishinaabe Indian, has friends and mentors in the tribe, but has been the sheriff of Aurora enforcing white men's laws. After a confrontation between whites and natives that caused him to kill a white resort owner, he lost a recall election. He has been deeply grieving which caused him to lose his marriage. Cork has started a new relationship with Molly Nurmi but hasn't given up hope of rebuilding his marriage to Jo in order to keep his relationship with his children. When a woman in town asks him to help locate her missing son, Cork finds himself in an investigation that leads to the death of a prominent and heartily disliked judge, Minnesota militant groups, Indian casinos, and small town corruption and secrets. I liked the setting. I liked Cork who was a man who fought for justice more than he fought for the law. I'll be reading more of the series which has now reached sixteen books. "Yeah." Parrant gave him a brief smile of thanks. But he was a man way on the other side of something terrible, and the look in his eyes came from far, far away. I got this one in exchange for an honest review from You can buy your copy here.